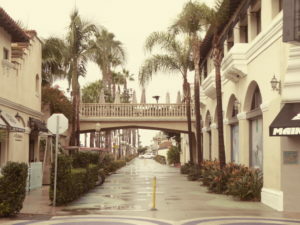 2 November, the day started chilly then it rained – not a good day to visit Newport CA and Balboa! 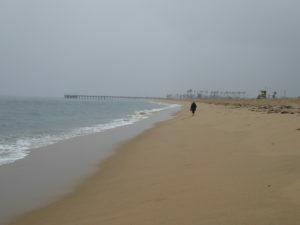 We walked on Balboa Peninsula beach and it gradually stopped raining and got passably warm. 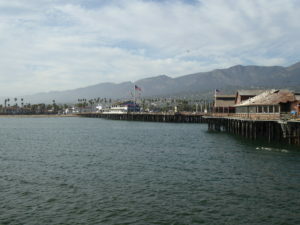 Then up Highway 1 to Huntingdon Marina for lunch, a stroll on the beach and then to Los Angeles Airport where Lucy packed and was last seen heading off to airport security. 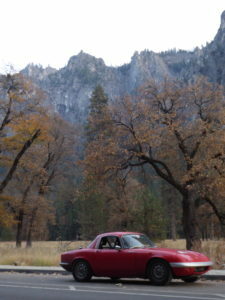 Tomorrow I take the car to the shippers and fly back. 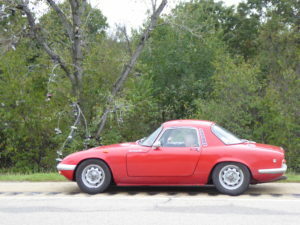 Not sure when the Elan will arrive as its currently booked as “awaiting a share” for its container. We have done over 8,000 miles without losing any time on the road apart from one fuse. All the other mishaps have been identified in the car park/garage. Its running rough, though tick-over and starting are fine. Various things need attention – guess where I’ll be over Christmas! (actually the slow freeway but we’ll gloss over that – traffic in the LA region is awful). I was geared up for sun but it was chilly and overcast. 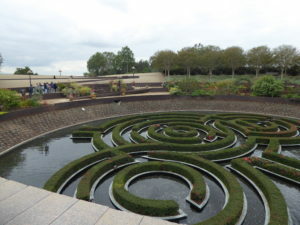 we visited the Central Garden where Lucy carelessly assumed that the Garden Guide would know about plants – but as the original garden designer knew nothing about plants why should the Guide who was more interested in the artistic combination of colour, shape, texture, size than what the plants might be? 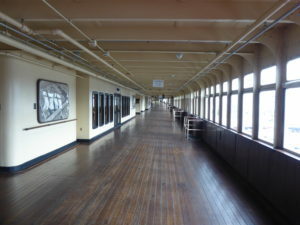 Our next stop was the Queen Mary – we had crossed the Atlantic on this ship in 1956 or so – a visit was mandatory; Lucy was thrilled that her memory of the childrens’ play area was correct. 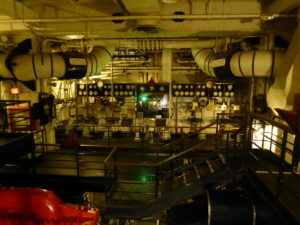 As a sign of changing times we had coffee and muffins at Starbucks on the main deck! That was it for the day so on to our motel (very down market for Lucy’s taste). 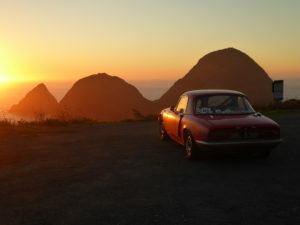 On the freeway (at dusk), a fuse blew and we lost the camera, fuel gauge and more importantly the TomTom – as we had little idea where we were or where we were going this was bad news. Fortunately it was just a fuse and once replaced, normal service was resumed – phew! 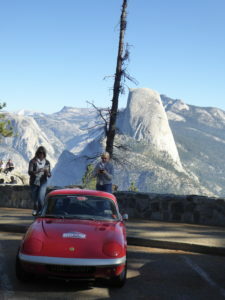 Half Dome, dead tree and Dutch Admirers! 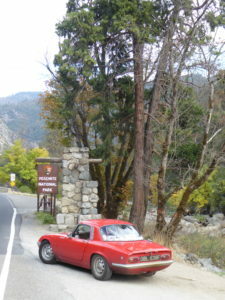 Then a slow descent through roadworks and a long run into Fresno. We grabbed lunch in the ten minutes before the café closed at 2pm; Fresno seemed dead and its only claim to fame was a memorial to the Lao people who fled the incoming Communist regime after the Vietnam war. 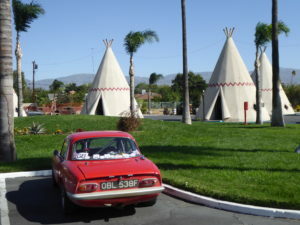 A long fast run (interrupted by traffic jams) to just outside Los Angeles where our cheap motel is extra security conscious – its the only place where we have both been required to show ID and our passports scanned to the LA Police. The local fast food restaurant also needed ID before serving beer – Lucy didn’t have hers but mine seemed ok for both! 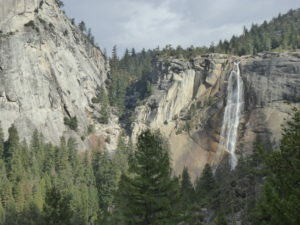 we climbed to the Nevada Falls, passing the Vernal Falls on the way. 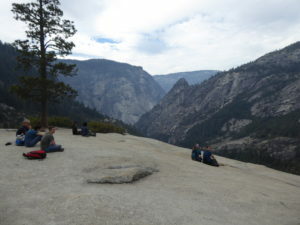 Our descent was confusing as we followed the “easy route down” – the John Muir Trail, which went uphill in a series of hairpins before eventually turning into a gentle in contrast to the steps on the way up. Someone had invested heavily in the footpaths, building them rock by rock up the hillside. The walk took us nearly 7 hours in moderate temperatures. 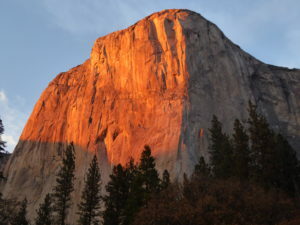 29 October – Yosemite! We set off from a dull Petaluma onto Highway 101 and over the Richmond Bridge – a two tier structure with eastbound (us) underneath and westbound on top – looks good though! 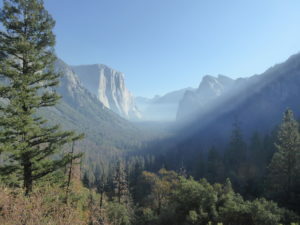 We had to climb to about 3000 ft over a ridge to get to Yosemite and the car got hot but not too hot; I had already swopped my shoes for sandals – we had found the sun we had come south for! 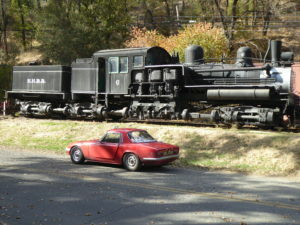 First stop was a post office to post some cards – and conveniently there was a 1920’s stem loco waiting to be photographed! 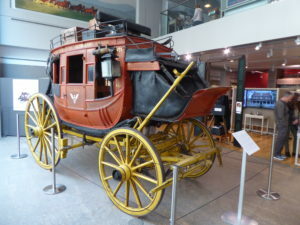 I was aware that on this trip to USA I had failed to take a photo of that workhorse of the westward migration. 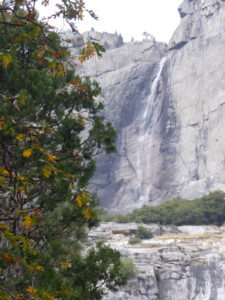 Great waterfall but its bone dry! 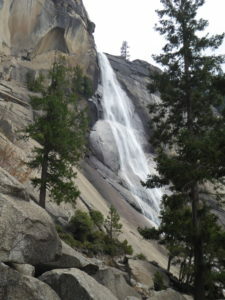 (the Yosemite) but it had dried up – no rain! 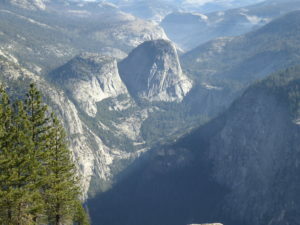 The valley is formed of a flat floor with tall pines vying with each other tto reach the sky and high steep cliff sides, some with waterfalls and others with groups of shrubs and trees clinging on in desperate search of life. 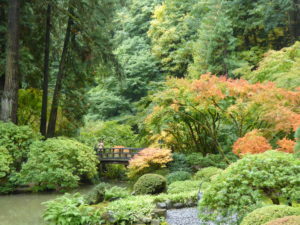 The autumn colours (late this year) add another dimension. 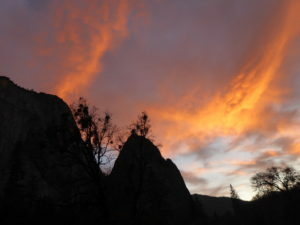 Half Dome or the clouds over the western entrance? 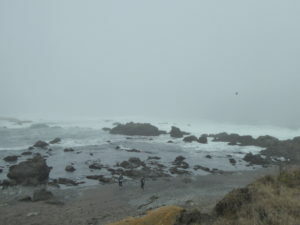 28 October – another slow start with a drawn out breakfast at 9.00 and a walk round a very cloudy Westport so we didn’t leave until about 11.30. 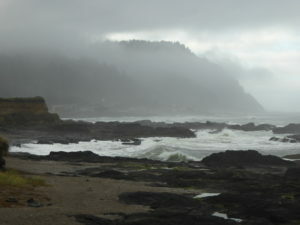 Westport had been a logging port in the 1890’s with timber jetties extending far beyond the shoreline to enable the logs to be loaded onto coastal schooners for onward shipment. 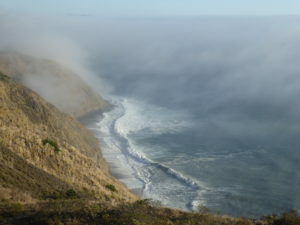 All that construction is long gone – a pattern repeated along this section of the California coast. At Fort Bragg (our intended overnight stop from yesterday) Lucy dragged me round the botanical gardens. Then on south chasing the elusive sun which showed briefly at around 2.30 for half an hour. 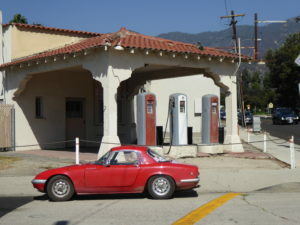 At a fuel stop we came across two people who had owned Lotus in the past and gave a reminder of how little interest the car has generated; (in a village 14 miles earlier a motor cycle loving garage owner had suggested we didn’t buy his “regular” gas as the next stop had “premium”) we also saw a frog eye sprite (“bug eye” in American) who waved enthusiastically. 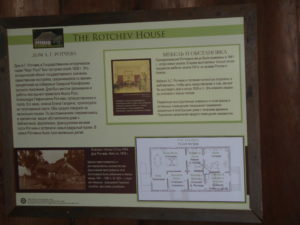 has information panels in Russian and sees itself as a link between Russia and USA. 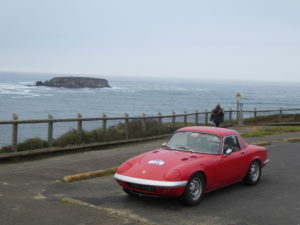 The last couple of days on the coast road the Lotus has showed what it was designed for – the electrical problems seem behind us, the car starts happily even though we have the lights and wipers on fairly continuously in the cloudy gloom and the too frequent late night travel (not today as we set 6pm as a deadline); the handling is much better with higher tyre pressures – currently 34 psi but I want to try 36. 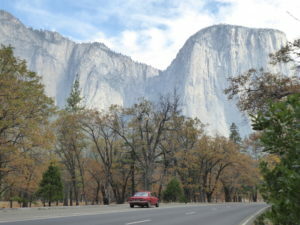 We are one of the faster cars on the twisty hilly roads – tomorrow our drive to Yosemite will show how it copes with high speed motorway travel. Carry on car – you’re doing fine! But the lasting impression we will take away is the universal friendliness of everyone we have come across – even the most stupid and basic questions receive a friendly response. Another impression is the early closure of everything – we have been the last to leave almost every eatery in the last few days – today was 8.30 which we were told was local licencing laws but 9.00 or 9.30 are common place even in large towns. 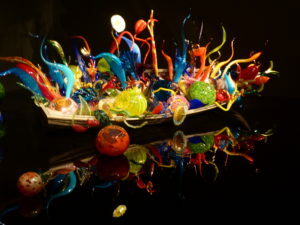 27 October – a mixed day. The motel didn’t do breakfast so sister was dragged to the only open breakfast vendor – a well known brand – and is not keen to repeat the experience. I checked the tyre pressures to see if the handling issues might lie there. 3 tyres had lost about 20% of their pressure and the 4th was nearly flat – the inner tube valve stem was leaking. 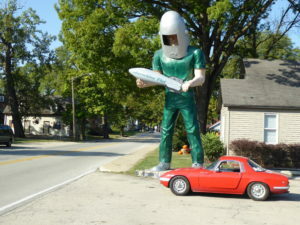 So off to possibly the largest tyre shop chain in USA – not an experience I want to repeat! There was zero interest in getting me on my way – each customer was taken strictly in turn, even those who had left the car for the day. I had to be registered on their system – my phone number and post code didn’t fit into the system so that was a bit pointless. It took the best part of 2 hours before we left – and I had to supply a new inner tube as they had none in stock. The handling was definitely improved. 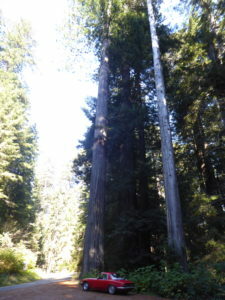 Today was to be Redwood day so we moved between Redwood forests, pausing only in Eureka for a very late lunch. 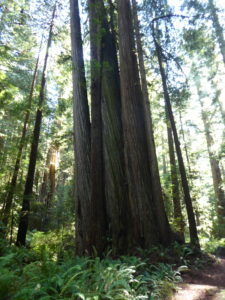 lost our trail returning from the Giant Redwood on the Avenue of the Giants – it was after sunset and dark in the shadows of these great trees. all of which look the same after dark! But we found our way back, using a fallen tree as a bridge over the stream. Then it was night driving to our hotel. 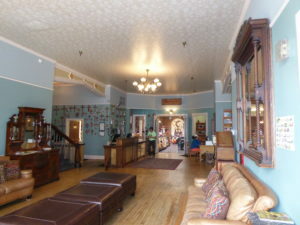 We had not booked and had more or less resigned ourselves to either supper or a bed (unlikely to get both as everything closes so early) when in a tiny village on the scenic route south (not very scenic two hours after dark), we found a very smart Victorian era hotel who had both bed and supper! A real stroke of luck. 26 October – today started well, I retarded the ignition and the car started without the “grinding” of the past – and the exhaust was less smelly – happy car = happy me! Never mind all this checking exact timing- does the car start? That’s the best timing position! Ok it meant that the engine was likely to stall at any junction but nothing’s perfect! We had a late start and it was misty and overcast. 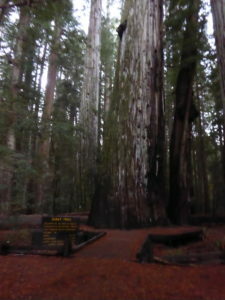 We went to see the Giant Spruce – 550years old, 185 ft high and 40 ft girth – yes the Redwoods are older and taller but they are in the future. 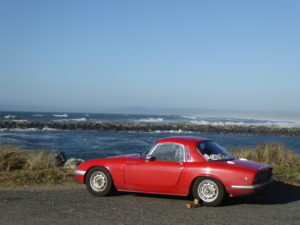 We continued down the Oregon coast to our overnight stop at Brookings; the car was fine except for the steering but there were serious cross winds and the steering is fine just the suspension isn’t and at the 55mph speed limit what’s the problem? Generous curves, straight stretches…excellent Lotus territory. This picture was taken just before the sun went down below the horizon, we got into the car and a minute later the TomTom switched to night-time mode – spot on timing! 25 October – another wet day! The car didn’t want to start, which was not good. We planned to go to a house museum but being “winter” it didn’t open till 10am so we went to the Maritime Museum. 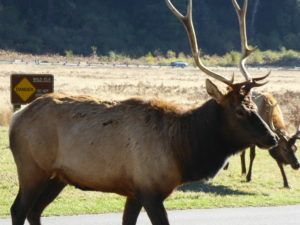 We then planned on Fort Stevens – a military base with a long history – but it looked desolate so I decided I should have someone look at the insufficient charging of the battery. After several “no thanks” phone calls we found a garage who were available at 1pm. Result – inconclusive! The system was charging and the battery just passed one test and happily passed another. They suggested we leave the car overnight so they could try it cold; this was not in my plan so I bought some jumpleads instead. We ventured into the rain missing all those golden, sandy beaches and Lucy had to made do with the motel swimming pool. Maybe the car will start tomorrow and maybe the rain will stop……..
24 October – the good news is that the speedo now works! I am concerned about the electrics as the starter grinds and its not charging as it was before; it seems that the battery charges when going uphill more often than otherwise – sister is convinced there is a correlation – so maybe electricity flows down from the front to the back? 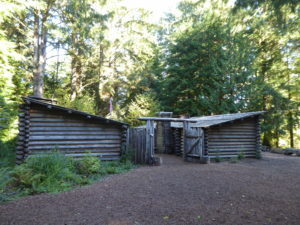 A short day as we only drove for about three hours to Fort Clatsop, The spot where Lewis & Clark over-wintered in 1805/6 when they arrived at the Pacific. 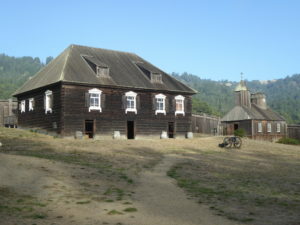 There’s nothing left of the old fort, just a replica. Up to 1985 the area was a bustling logging station where logs were assembled into “rafts” before being loaded onto ships for export to Japan and Korea. 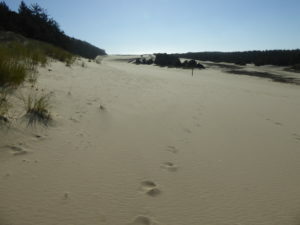 Now its a state park and all peace and quiet, particularly out of season (winter here started on 1st October). 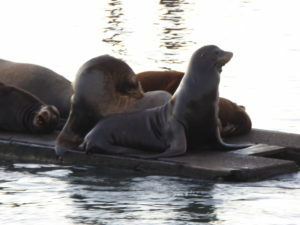 Lunch was at a craft brewery and the strangled screeching we heard was the Sea Lions who use these shores to rest on the rocks and sea level pontoons which humans have so thoughtfully provided. 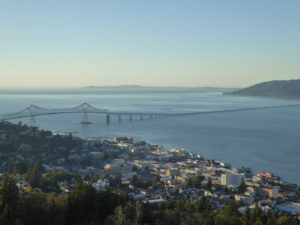 The Astoria Column (erected by a railway baron in 1926) gave fantastic views in all directions (once you’ve climbed the 163 steps). 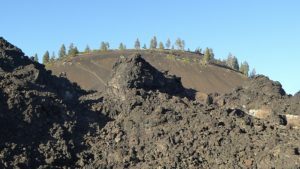 a lava field at Newberry (last eruption 1300 years ago) ending in a craft brewery. I was abe to instal the speedo cable which my sister brought with her – today will tell if that makes the dial come to life! 20 October – before leaving Ellensburg I restored the connections to the rev counter so there was now only one dead dial on the dash. 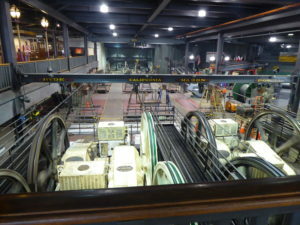 I also checked the website for the Boyer Bransden connections – both had been disconnected in our attempts to solve the points problem. I was much relieved when the Boyer Bransden unit resumed as my stock of 3 new points was now exhausted – one causing trouble, one not fitting and the third in use. 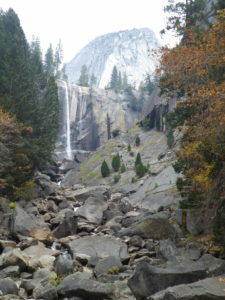 We followed the route given by the motel to a waterfall – just it wasn’t there! So we had a short walk along a valley coloured by the yellows of autumn. From here we dropped down to the Columbia river and the Lewis & Clark Trail (theirs was the first expedition to cross the western USA from St Louis to the Pacific in Oregon in 1804/6). 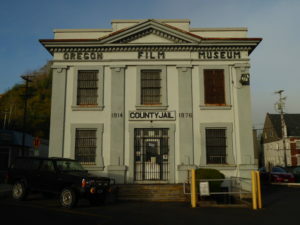 We stopped at the Maryhill museum, once a railway baron’s mansion and now an art museum in the middle of nowhere. 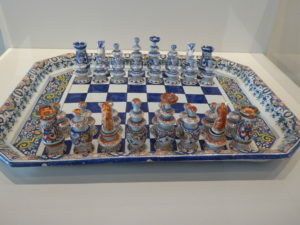 Garage spaces designed to hold 24 cars now showcase Rodin sculptures but it was the variety of chess pieces and sets that really caught the eye. 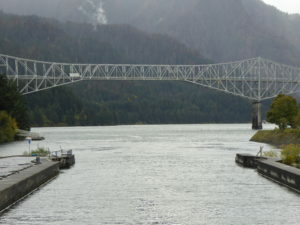 On to Cascade Locks, once fearsome rapids but now under the waters of the dam. After that the rains came and the road to Portland became a river and very difficult driving with road markings invisible under standing water. In Portland we met up with friends for a beer and a Courtney Barnett concert. 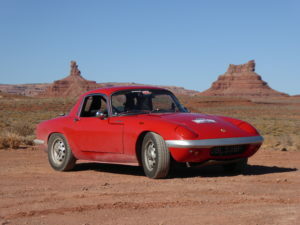 The Elan was left in a weekend garage as we were whisked away in a 4WD for a night’s sleep. and Allison returned home to see the dogs. 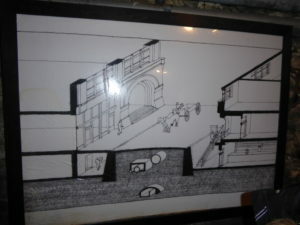 We had time to visit the hilarious Underground Seattle tour showing how Seattle’s streets were lifted by a storey after the great fire of 1889. 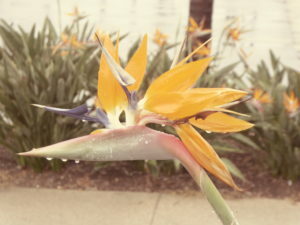 I decided I had had enough of the rain and cold, with the car being blown off course in the dingy spray of the Interstate – I was heading south for the sunshine! 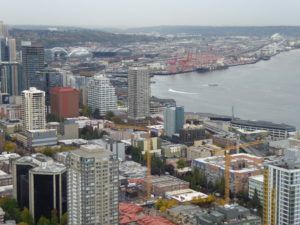 We endured more Seattle traffic and crossed the Snoqualmie Pass and what was surely beautiful scenery had I been able to see it! Sister said it was spectacular! Showing how we treat Elans! Golden Gate Lotus Club hosted by Status Autos of Redwood City (www.statusautosinc.com). 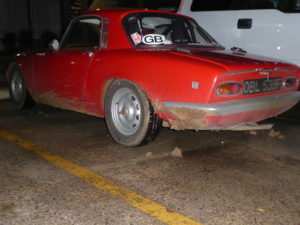 Our Elan was clearly the scruffiest car there, no great surprise! I guess that after I had shown some slides of what we do to Elans, they probably thought the car was in remarkably good shape! 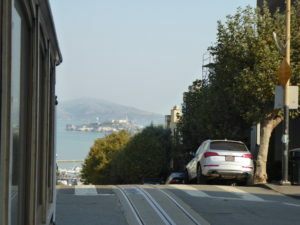 We left our friendly hosts and took the scenic route over the Golden Gate Bridge in the general direction of Seattle. 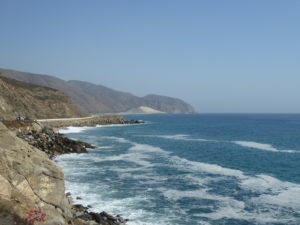 First choice would have been the Pacific Coast highway but its about 5 hours longer and we didn’t have that in our timetable. Second choice was Highway 101 but that runs through Santa Rosa, which has just been decimated by the California Wildfires. 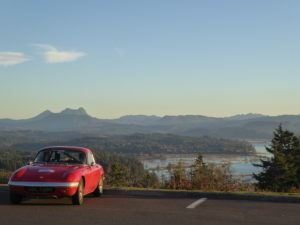 We decided on the boring but practical Interstate 5. 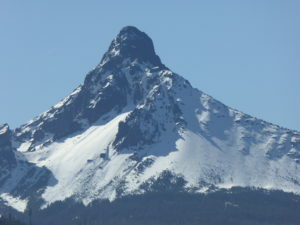 It wasn’t all bad and the scenery round Mount Shasta where we stopped was spectacular but very cold – seriously cold! We put the heating in on our hotel room. 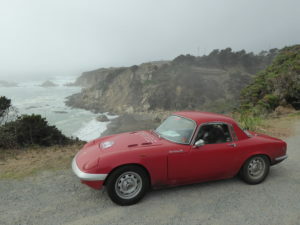 Day 2 we had 400 miles ahead of us, stopping only at two sites from the “50 Great Drives Book”. 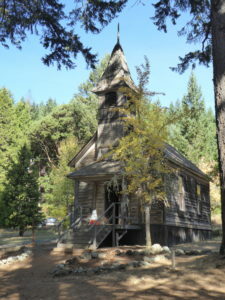 One was a wash out – the “Oregon Vortex”, the second was the goldmining ghost town of Golden where just a couple of buildings remain and the creek, carefully cleared up by teams of volunteers – it was hard to see this peaceful valley as a goldmining location with powerful water jets pulverising the rocks and polluting the entire downstream. Mission, the pearl of Missions. An imposing set of buildings with a clear view to the sea, this must have been impressive in the late 18th Century when the Spaniards started converting the indigenous peoples. 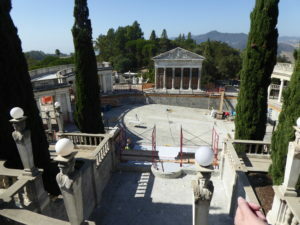 Mansion full of antiques bought largely from Italy. 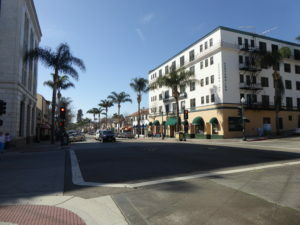 Our overnight stop was in Salinas. I drove the car over a kerb in the dark – yet another thump on the unfortunate sump guard. The car is now making some very nasty noses which I hope is only the exhaust banging against the sump guard – if its not that then it may be more serious! 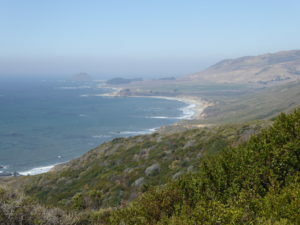 The second day we set off for The Big Sur – on the northern section of the Highway – sadly a mudslide earlier in the year has cut the Highway into two sections and the missing link will not be repaired until early in 2018 – so we had to approach Hearst Castle from the South and the Pfeiffer Canyon from the north. 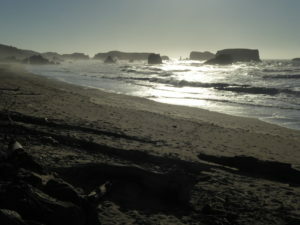 The bridge at Pfeiffer is also down – due to be re-opened tomorrow – so we went to the nearby Andrew Molera State Park for a lengthy walk before returning to the eccentric Carmel and its famous 17 Mile Drive. 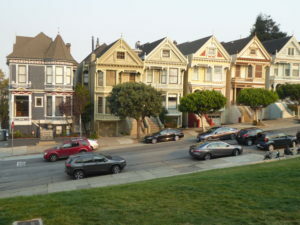 We were slightly later than planned into San Francisco – and the evening traffic was something else! 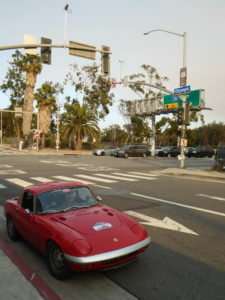 We had over an hour of stop start darkness driving on the Freeway with an unhappy Lotus but somehow the TomTom kept us on track and we reached our overnight stop – exhausted! 10 October – where did today go to? 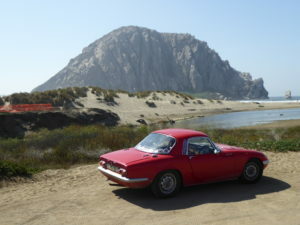 It is 90 miles from Santa Monica to Santa Barbara – we took a long route but it still took all day! We started thinking that our hotel booking for Santa Barbara was just too close then realised that we needed time on the car so spent some time driving round various “shops” until we found a friendly wash/lube who let us use their pit to check the underside of the car and all those nuts that want to come loose in the course of a long journey; then there’s gearbox oil level and oil filter. I reckon the diff oil level was ok as the whole area is completely dry whereas the gearbox is like an oil well! That done it was the Pacific Coast Highway to Malibu for breakfast which became brunch – a roadside burrito for me followed by a chocolate cake in a swish restaurant for Allison. 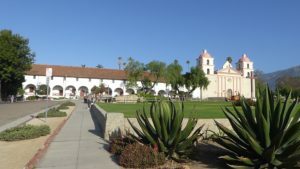 We continued to Ventura and then Stearns Wharf in Santa Barbara – not even time for the famous Mission but we did visit the Mission in Ventura. 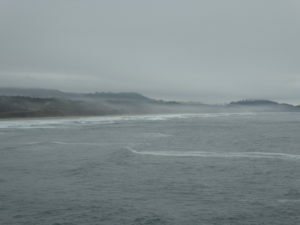 9 October – The Pacific. A short day of just over 100 miles – well perhaps! We left at around 8.30 and arrived shortly after 5pm. 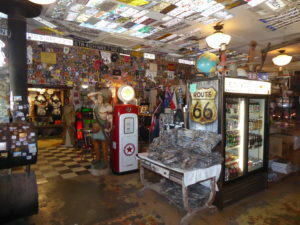 There were plenty of detours and Route 66 things to see and cafes to stop at. We followed some (now) dead end alignments, including one that has a Mormon Trail Marker indicating the route they took from Salt Lake City to the west. 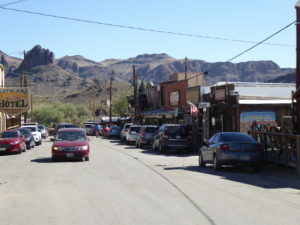 Over a summit and alongside a creek we found our way to San Bernadino – definitely the back end of this town with the strong wind throwing dust at our open window (the other one remains broken). 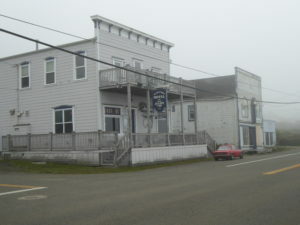 a couple of closed Inns, cafes and a 1915 pharmacy, now a café/gift shop. 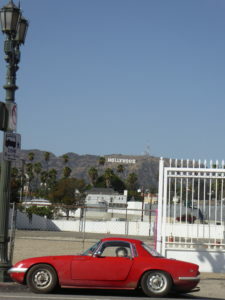 We drove round various parts of LA – both planned and unplanned – as well as various side trips to try to get a photo of that “Hollywood” hillside sign and the Lotus. 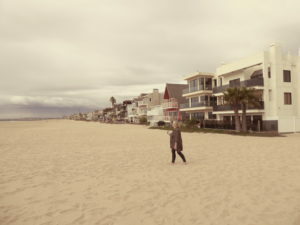 Then on to Santa Monica where we visited the “official” end of route 66 – at some traffic lights – and the unofficial end on the pier where haze again dampened the photos. 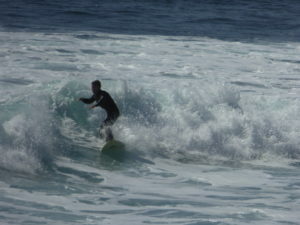 The Route ended with a paddle in the Pacific. Without a speedo I cannot be sure of our mileage from Newark but I think it was just over 3,800. 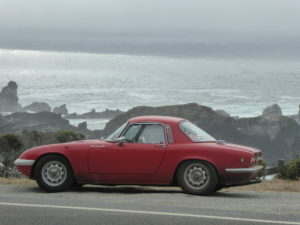 Now on to the North and Vancouver………..looking forward to meeting some of the San Francisco area Lotus owners next weekend. 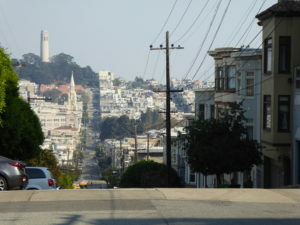 8 October – to California. What should have been a short day got longer! 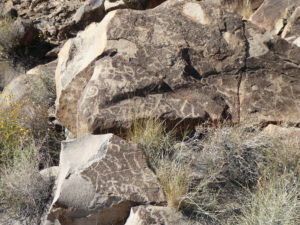 We started a little later than planned and then headed north rather than south; having sorted that out our route to the Petroglyphs at Sloan Canyon was interrupted by the construction of a new gated community there’s an awful lot of new building just south of Las Vegas. Heading south once more we left the Interstate for the 5 miles of the Zzyzx road which goes to a dried up salt lake and the Desert Studies Centre – cars aren’t allowed on the lake bed but we are and Allison found a tennis ball stuck in the dry mud – house joke as we always find tennis balls when walking the dogs at home in the lush greenery of the Norfolk Broads. 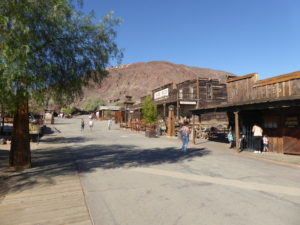 Further south we came to Calico Ghost town – a silver mining village abandoned in the 1890’s when the price of silver plummeted – now a theme park. Fuel costs a little more nowadays! temperatures moderated from the day time 35C we regained Route 66 near Barstow. 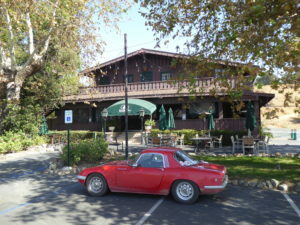 Sagebrush Inn, a Roadhouse – what you saw was what you got! 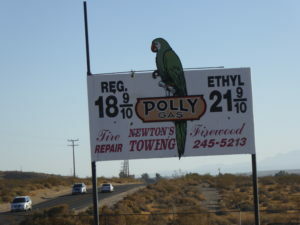 We reached our hotel in Victorville at around 7pm – a long hot day. 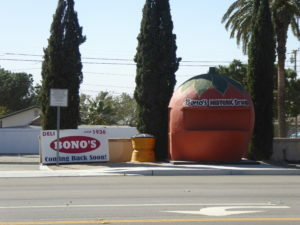 7 October – in Las Vegas. 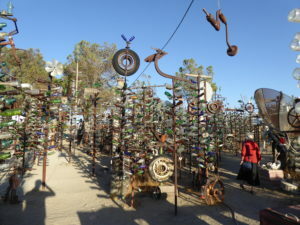 By way of contrast to the extravagance of Las Vegas we visited the Las Vegas Springs Preserve. 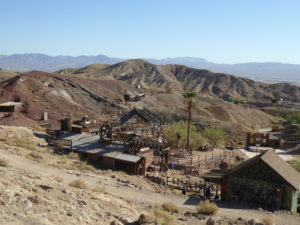 This was the origin of Las Vegas – the Springs which provided the water which made life possible when Las Vegas was an oasis in the South Nevada desert. 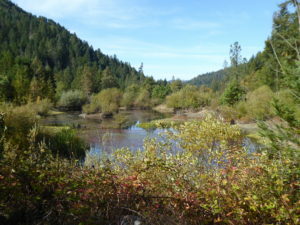 It was only recently when excess ground water pumping reduced the water levels that the Springs dried up. 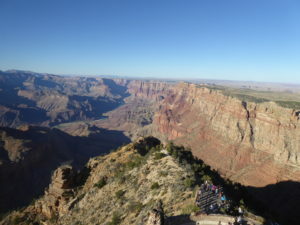 Now water comes from the Colorado river – and tourism is only 5% of the usage – a figure I cannot understand seeing all the massive hotels in the town! 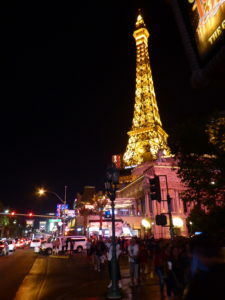 In the evening we toured The Strip. Checked that fan belt again and decided that it did have ½ inch play and didn’t need attention (too tight and the water pump is damaged which is a major engine repair job). Leaving at 7.30 ish it was chilly – and the car felt it (doesn’t like the cold!). 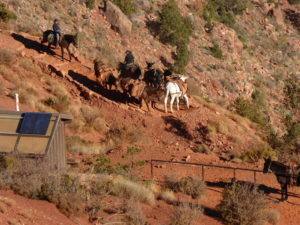 Spotted 9 or 10 of the Borgwards we had last seen in St Louis; they were heading towards Grand Canyon, their trip had taken them to Phoenix, which was not on our route. 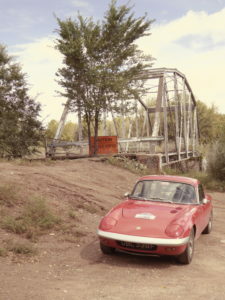 At Williams we rejoined Route 66 and a few miles later followed what the book describes as the start of 159 almost uninterrupted miles of pristine route 66> The road was empty until Seligman which was full of tourist busses, whose occupants were more interested in the kitsch than a live Lotus Elan – shame! 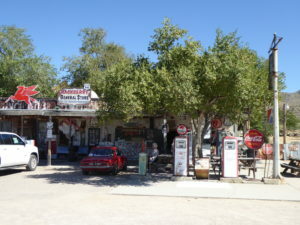 Then to Hackberry and a general stores full of things only tourists would need. One feature here were sets of five “Burma Shave” (a brushless shaving cream from the 1920’s) roadside adverts. 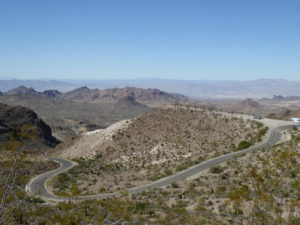 At Kingman we chose to detour off the direct route to Las Vegas by tackling the Sitgreaves Pass, a narrow but now well maintained road which used to terrify previous generations who paid the locals to drive their cars up and down the 3550 ft mountain pass. 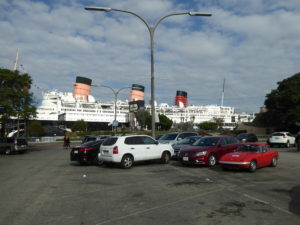 but is lined with modern tourist cars. An actor plays the sheriff and discussed with us whether we should be fined for having our steering wheel in the wrong place!. 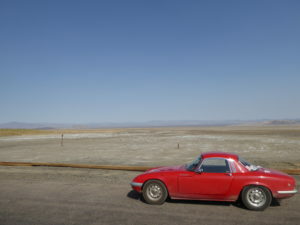 Then across the desert to Las Vegas, experiencing the extremes between the empty expanse and the clogged urban motorway system. Somehow the car coped with both. 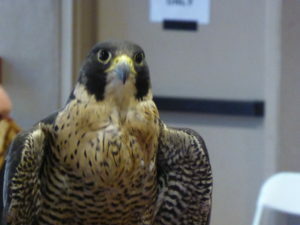 Our hotel, the Luxor, is huge; checking in was as if we were at an airport with snaking lines of guests shuffling forwards and took over half an hour. 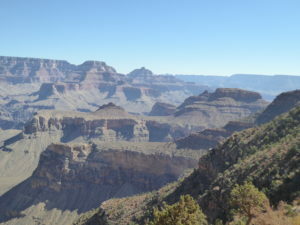 5 October – rest day at Grand Canyon. 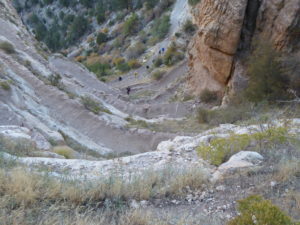 An early morning descent about half way down the Canyon and twice as long to get back up! Its very chilly before the sun’s rays warm you up, then its too hot. 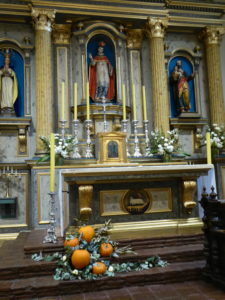 4 October . 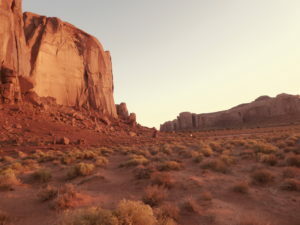 It was an early start to meet at ten past six for a sunrise tour of Monument Valley (the bus arrived at 6.30!). 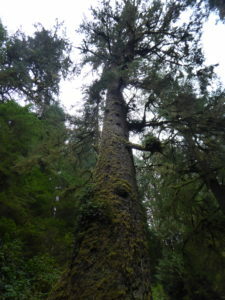 We meandered around a trail in the valley, spending quite a lot of time at a “hogan” (anglicised spelling) – a native Indian woman’s house – of a lady who sold horse riding tours and various crafts – am I cynical? Breakfast was late and slow so we didn’t hit the road till 10.30. 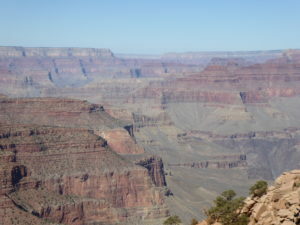 Again there was a direct route to Grand Canyon and the scenic route via Page and the Horseshoe bend where the Colorado river tries to do a 360 – or at least 270 – on its way to Grand Canyon. 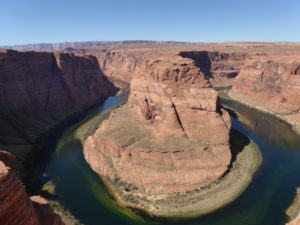 Research had shown that none of the walking trails that we could do in the time available in Grand Canyon would give us a view of the river – so we joined lots of Chinese tourists at Horseshoe bend. baby canyons reaching Grand Canyon to find that the day had just got longer – we had crossed another time zone and our early start now seemed even earlier. 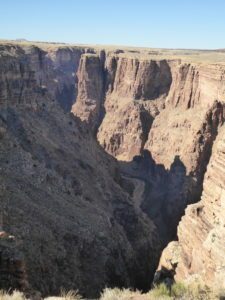 The eastern entrance to the Canyon National Park brought us in near the Watchtower – which gave good but hazy views over the Canyon. 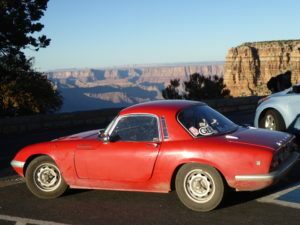 I almost managed a photo of the car and the canyon! 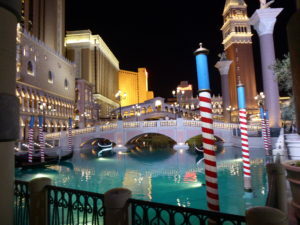 Tomorrow is a rest day before we head off to Gambling World – otherwise known as Las Vegas – and no its not on Route 66. 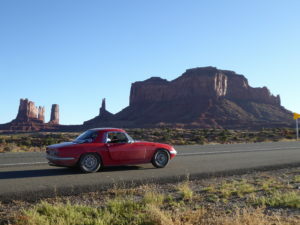 We went off-route to visit some friends in Colorado, rejoining the tour at Monument Valley. Our route was north west from Albuquerque to Durango and on to Lake Vallecito (7200 ft). The speedo failed as we left and despite my efforts to revive it there’s no sign of life – so if anyone asks how far we went – I don’t really know! I tried fixing it the next morning- but failed – the TomTom shows my speed so I should be ok with speed limits. I also tightened the alternator belt which had screamed at me yesterday – it was about right at 8am when the sun was down and it was 3 degrees but by late afternoon when it was somewhere over 30 degrees it felt rather tight – have the pulleys expanded? 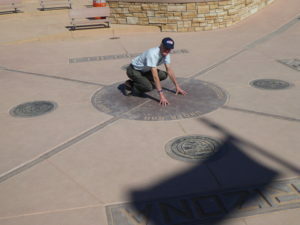 We left late for 4 Corners – the meeting points of Utah, Arizona, New Mexico and Colorado. 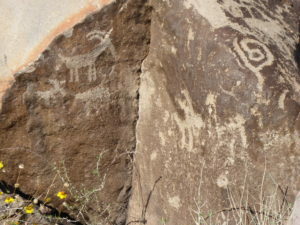 A great disappointment – sales opportunity for Navajo Indian tourist ware and apart from that a disc in the concrete. 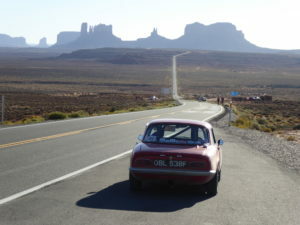 Then to the Valley of the Gods and on to Monument Valley. The latter probably the most recognisable image of the Wild West – sadly for my photos we were there at the wrong time of day and it was hazy. 1 October Rest day in Albuquerque – the best laid plans…….. I had planned to spend some time on the car this morning to check the brake squeal. I had not planned on replacing the clutch slave cylinder in the hotel car park – but that’s what I had to do as the clutch pedal went straight to the floor when I tried to move the car to a less busy area. Not my favourite task but I do carry 2 spare cylinders and looking on the bright side – we had the time, it was not raining, it was warm and I had a secure place – so all in all it was a “good” thing! 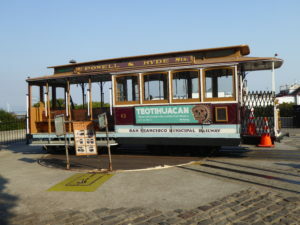 The last time I replaced it was in Peru in the Urubamba valley after visiting Macchu Pichu – maybe hotel car parks and clutch cylinders have something in common? We then visited a museum (coffee and cakes by way of contrast to the tarmac car park!). 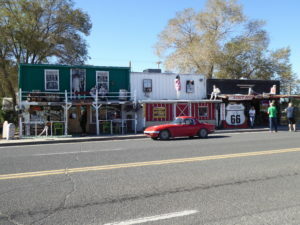 Then eastwards along the newer (1950/60) track of route 66 through Albuquerque and the “music road”. There is a small eastbound section where if you drive at 45mph with the wheels on a particular strip you get “America the beautiful”. Its true!! 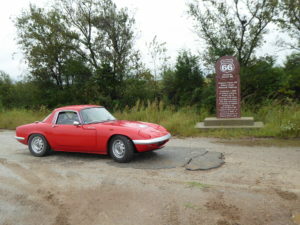 Though Allison says it was flat – maybe I drove at 44 and not 45? 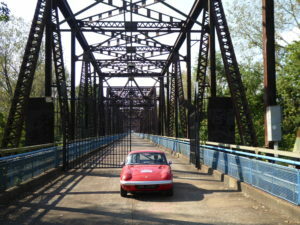 We returned on the Interstate and were tourists in the Old Town – and the clutch reservoir is still full!! Tomorrow we leave the route to visit friends in Colorado and after that its Monument Valley and then two nights in Grand Canyon – photo ops to be sure! 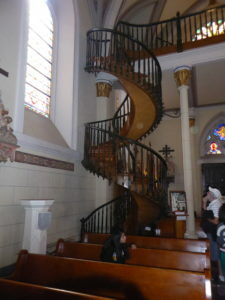 30 September to Albuquerque. There are two “alignments” of Route 66 between Tucumcari and Albuquerque. 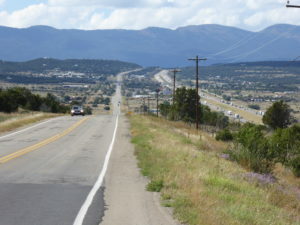 One is the direct (later) route which is largely the current Interstate and is a direct east/west line; the other has east/west, north and south elements – we chose the latter via Santa Fe. 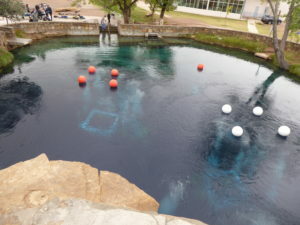 The rain cleared before our first stop at the Blue Hole of Santa Rosa – one of a series of linked lakes, connected by a natural underground system with a constant supply of clear water, very popular with divers. Then we crossed the flat lands of New Mexico to Las Vegas (not the Nevada version!). This was not on route 66 but was used as a source of provisions by travellers – so we had morning coffee in the genteel surroundings of the Plaza Hotel. 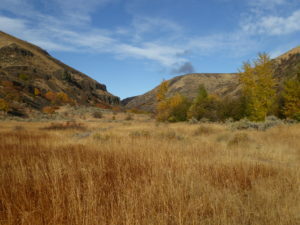 From modern comfort, the route took us past Starvation Peak – a place of fear for the settlers heading west. 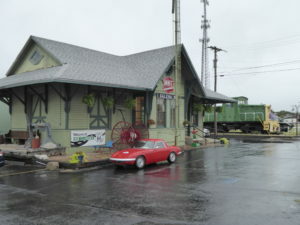 We visited a couple of Route 66 dead ends and dirt tracks – and were surprised to find so many US Post Offices tucked away in remote corners – you have to try pretty hard to find any back home! We followed a dirt track of old route 66 (4 WD only the book says) but did decide against the all-mud options after our previous efforts. 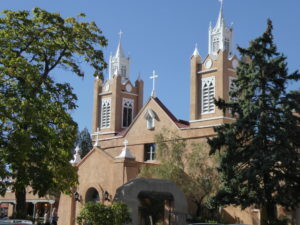 The area was full of history – the Santa Fe trail, the Old Pecos Trail, Civil War battlefields and Indian Reservations. 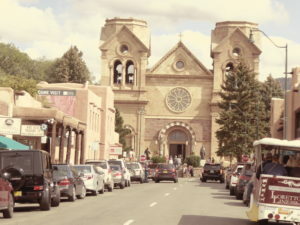 We stopped in Santa Fe, the oldest (State) capital city in USA with its Spanish Churches, arched walkways round the Square and its Adobe style architecture. 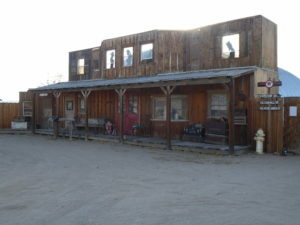 Then with the skies darkening and “precipitation in sight” we headed for our overnight stop in Albuquerque, deviating only for an Indian Trading Post – which was closed when we got there! Dinner was accompanied by the rumble of thunder, pity the car leaks. 1139 miles to go (precisely inaccurate!). 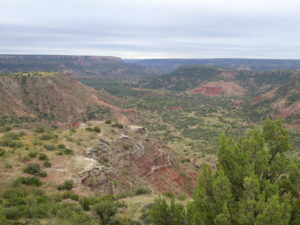 We started with Palo Duro Canyon, the second biggest in USA. After the rain, the trails were closed but we were able to drive to the bottom and tried to find some stunning photo ops – limited success. 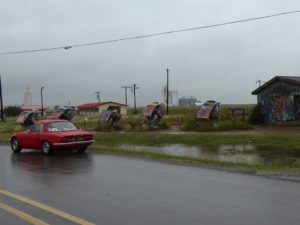 Then to the (in)famous Cadillac ranch 10 Cadillacs standing nose first in a soggy, muddy field where people are invited to add more spray paint to what is already there. I’m not a fan of getting needlessly muddy in a small, car! 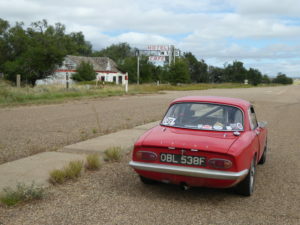 at Glenrio, which straddles the Texas/New Mexico border has a dual carriageway in one State and in the other a derelict motel which was once the first (or last) motel in Texas. 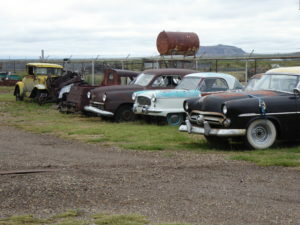 Before Tucumcari, we found yet more fields of rusting cars crying out for restoration – and this time they are for sale! 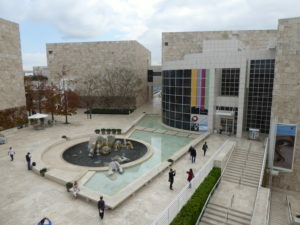 We arrived around 3pm (after another one hour time shift) to find that most of the museums had just closed. 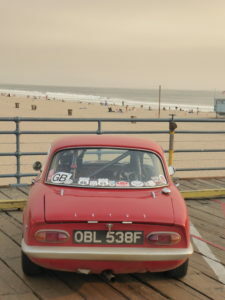 So spent a little time on the car, neglected up to now apart from fluid checks. We are losing water somewhere, the brakes are squealing, the handbrake needed adjusting and the passenger’s window is best left were it is. Otherwise all seems ok – mileage since leaving home 2600. 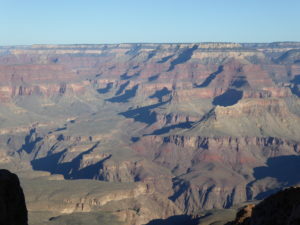 28 September to Amarillo. One of our first tasks was to find a car wash and clean off at least some of yesterday’s mud. Next stop was Fort Reno, part of the Red Indian resettlement program in 1860/70 but we were too early and it was closed. 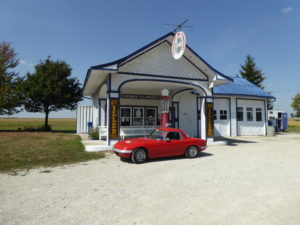 Then to more scenes of abandonment – a restored gas station and the aptly named Canute which the guide book says “is worth the detour for all the remains of old businesses”. 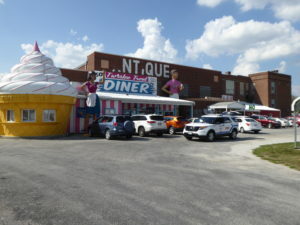 Just before that we visited the Oklahoma Route 66 Museum – described as mandatory by the book and there we met the other half of our tour – its only taken a week! 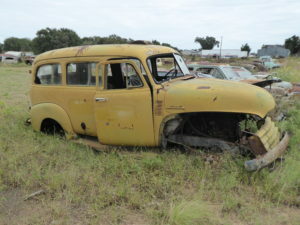 One feature of the road is the quantity of old, abandoned cars which in UK I am sure would have been snapped up for restoration. 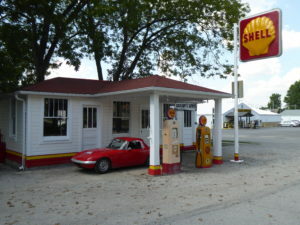 I parked in a driveway to take photos of a field; the owner drove up and, having asked how I get a gas can in a car so small, said that he put the cars there for people to take photos – but they were not for sale. 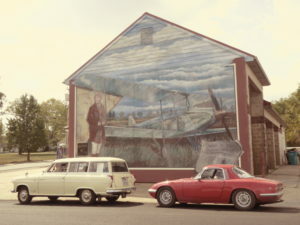 – a satire on “Cadillac ranch” which comes later – 5 VW’s dug into the ground. 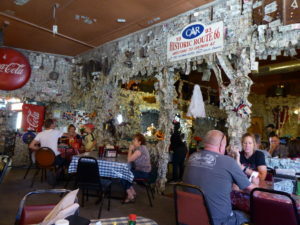 Our evening meal was at the Big Texan – a cross between showbiz and a restaurant. Limos whisk you from your hotel (ours was about an hour late) to a two storey hall where all staff wear Texan hats, there are 500 covers and they consume the equivalent of 14 cattle per day. 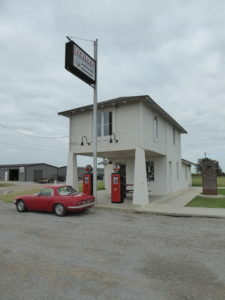 27 September to Oklahoma City – we knew today would be a long one – 295 miles if travelling direct and Route 66 is not direct and is stop/start, seeing things and using byways, towns and villages (and “unplanned detours”) – anything but the Interstate. We left at about 7 am and arrived 12 hours later. Most of the day it rained and was fairly chilly but we set out with shorts and T-shirts for yesterday’s weather! 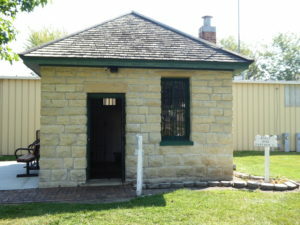 once a railway ticket office but picked up and moved to its new location on the main road. the Shoe Tree Loop where folk have hung shoes on the tree at the entrance and a stretch of the Ozark Trail – not to be attempted in the wet (it had rained all day so not the best of our ideas!). 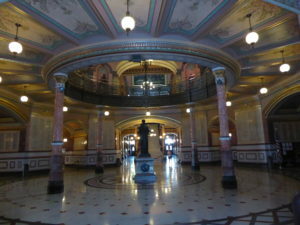 The attractions we missed were many times more numerous than those we visited – but with such a long day. Museum visits sadly are not an option. 26 September – the 5 Borgwards from yesterday have now become 13; seems that one as already had an engine transplant shortly after arriving. Our first site today was to a Jesse James museum – but as it was now winter, it was closed. 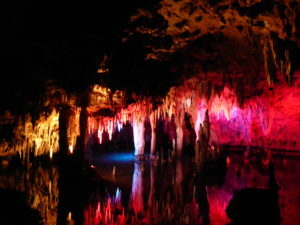 Then to the Meramec Caverns – a 24 mile complex of underground caverns, stalactites, rivers, outlaws (Jesse James again) and Civil War battles. This took a good chunk out of the day. and on to Lebanon before ending in the rain in Springfield. 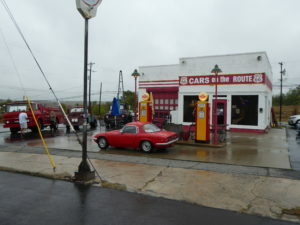 Our route book was written by a route 66 expert who encourages tourists to visit the “mom and pop” businesses along its length. 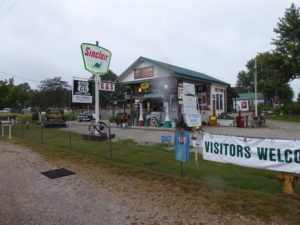 One such was a motel in Lebanon where we stopped to buy some souvenirs but I was struck by the anger of the proprietor towards us because our tour hotel was in the big city of Springfield rather than using her motel – understandable but unwanted. 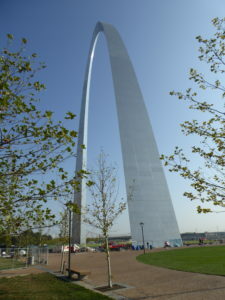 25 September St Louis, hot. 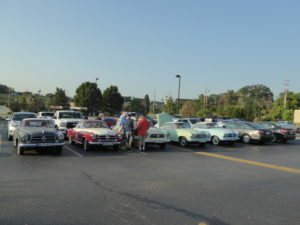 A group of 5 Borgward cars travelling from New York to Los Angeles had arrived at the hotel when we returned from sightseeing – how often do you see one let alone five? 24 September – Today was one of the lowest mileage days of the tour – but when we followed the meanderings of the Route – it got extended! 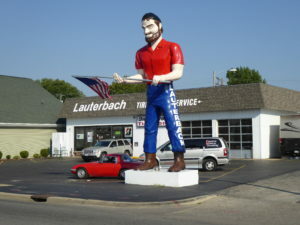 We tracked back into Springfield to find one of the “Giants” at Lauterbach Tire. 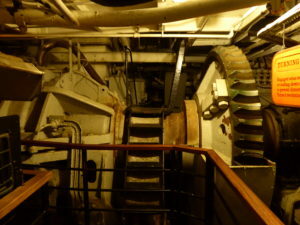 Then we had to decide which “alignment” to follow as today the 1920’s route was about 12 miles away from the 1940’s. 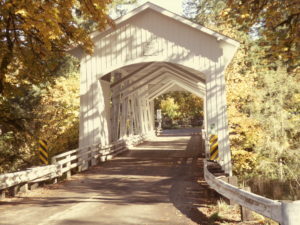 guide book described the next section as “an evocative concrete road like the snaking course of a river” as the road followed a series of right angles through the cornfields. 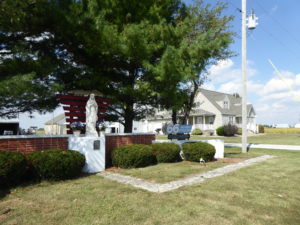 After the brick square in Carlinville we changed allegiance to the 40’s, visiting the Route 66 shrine to “Our Lady of the Highways”. Further on we had to visit the “Pink Elephant” Antiques, complete with more Giants – this was top class kitsch! 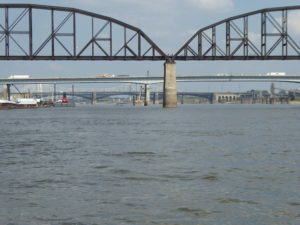 Our last visit was to Chain of Rocks bridge. 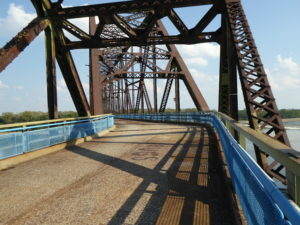 This steel and concrete bridge carried Route 66 over the mighty Mississippi for 30 years till 1965. Its famous for its bend – it’s a mile long with a 22 degree bend in the middle – and the scene of many deaths over the years. Now the bridge is deserted and all the roadside stalls, cafes and businesses have disappeared and its a wildlife park. There were just 8 pedestrians and a cyclist when we were there. 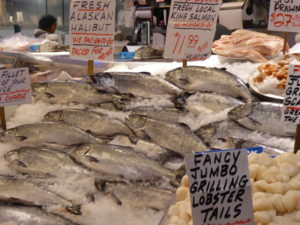 One of them gave us a good tip for our evening meal – and we still haven’t met the other members of our party! Tomorrow is another rest day in St Louis. 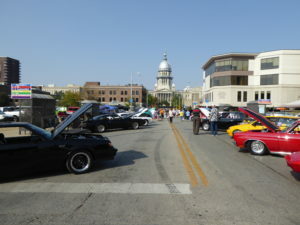 23 September – This weekend saw the annual Springfield car show with 1,000+ cars on display in the centre of the City. 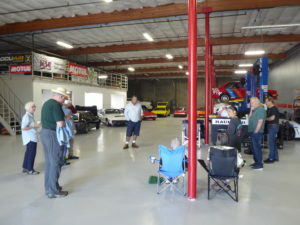 we had groups of people wanting to talk about the car and its travels. 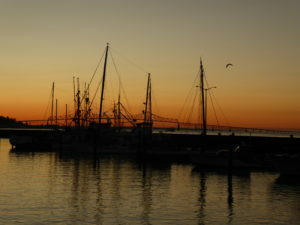 It was another hot day – temperature records were being broken as we sweltered at 94F. 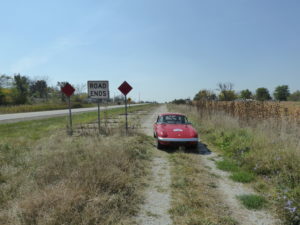 The Story of Route 66 – Road Ends! 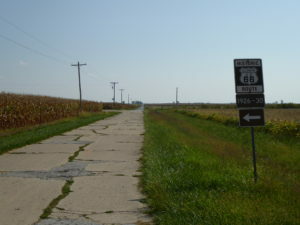 Route 66 now longer exists and has been superseded by the Interstate network, Route 66 had various adjustments over the years so its course moved and finally much of it has been removed. 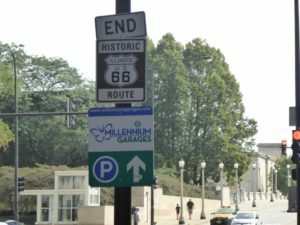 Various people have documented the Route’s history and each State has its Route 66 Preservation Society who have put up road signs – and helped the huge tourist industry riding on the Route 66 name. 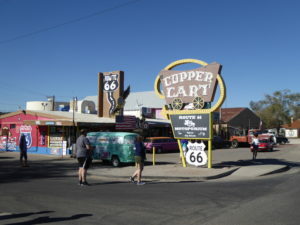 the major attractions, and the definitive Route 66 Guide. I had also downloaded a complete set of tracks for the Route for the SatNav – it was when the directions diverged that the fun began……..! 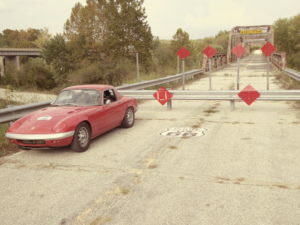 Our hotel was not on Route 66 so the SatNav took us to the nearest point on the route – and may have landed us in hot water as this included two roads with auto toll booths and we didn’t have the correct card or change – so we paid more but the Stop sign still lit up – hmm! Much of the world was on Route 66 today – Canadians, Portuguese, Americans and Brits – including a party from Caister which is about 6 miles from home in Norfolk. 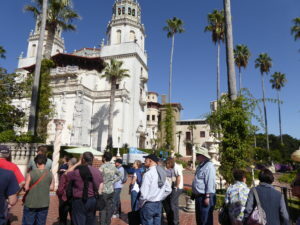 The people we didn’t see were the others in our tour group. 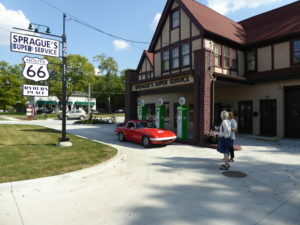 road are preserved petrol stations from years gone by, many painstakingly restored and now museums/souvenir shops. Others have been demolished and others turned into homes. 21 September – the tour starts today – so the organiser says! I arrived in New York late in the evening 4 days ago to allow two days to get to Chicago – about 800 miles – and one day in case there were Customs things to resolve. In fact there were none and I left the warehouse about 30 minutes after I got there. 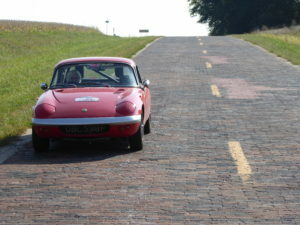 They thoughtfully brought a battery pack but the Elan started on its own. Everything seemed to be where it should be, the car was undamaged and off we went. I did nearly 450 miles, mainly on Interstates and around the same speeds as everyone else but faster than most of the “semis” (artics). Overnight near Erie. Then on towards Chicago but using highways today. Decided that Chicago hotels would be pricey so stopped in Valparaiso – having been to the Chilean original at the end of the Patagonia trip some years back. The similarities stop with the name! 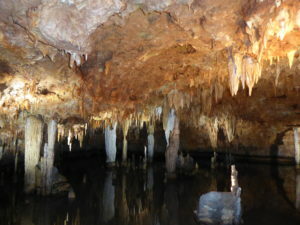 It was seriously humid and sticky – the temperature was about 90F and I was dripping. 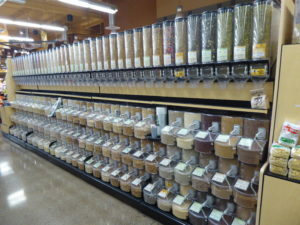 The local attraction is the Indiana Dunes, a National Park based on the dunes and coastal vegetation. Then to Chicago – parking was the problem – measured in $$$$. 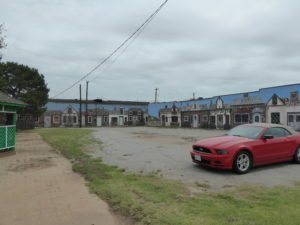 But I did find the end of Historic Route 66 and the Start. 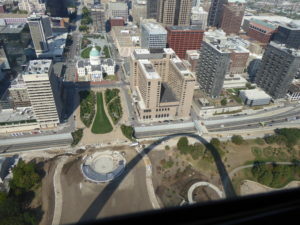 Seems that the original westbound Route 66 is now one way eastbound hence it is the end if you are travelling east! The current start is now on a parallel road one way west bound so I drove the first 15 miles or so before leaving to find the first night hotel. 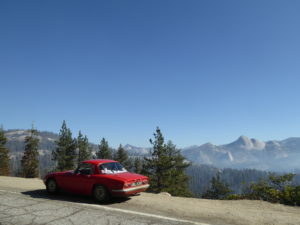 As on our last Tour with Scenic there is just one other car – why is the take up so low? Haven’t yet met Ronald and Angela – but have seen what I guess is their Ontario registered Mustang in the parking – we have about 20 days to find them! If you look at the map at the foot of our home page, there’s a large area without a little red car! The USA. So in 2017 we aim to rectify that. Getting to the “Land of the Free” has certain hurdles to overcome – first a full visa (having Iran in our passports is not a good start) but a trip to the Embassy solved that. 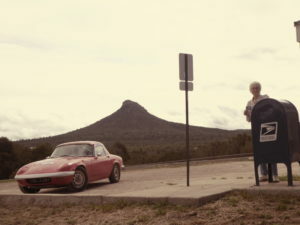 Then car insurance – UK insurers won’t touch USA and the Americans aren’t too keen as we don’t have a USA postcode – and if we did the car won’t be registered there. 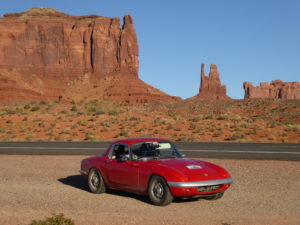 However there is an insurer who will cover us for a “Collectors Car Event” – the Route 66 Tour – and after that we have 40 odd days to do as we please (60 days maximum all in). Now we know the rules, we can play the game! 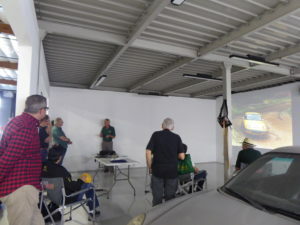 The Classic Persia rally was very gentle on the car, the sump guard was the main casualty having had too many close encounters with the frequent road humps (into, out of and through most towns). That has been fixed (reshaped with a large press) so we are good to go! Route 66 here we come! 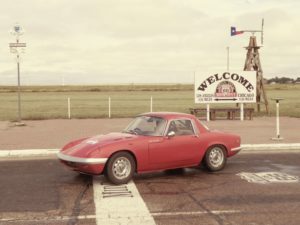 This entry was posted on June 3, 2017, 3:55 pm and is filed under Patagonia Rally 2010. You can follow any responses to this entry through RSS 2.0. Both comments and pings are currently closed.